Where we teach health is included under physical education requirements. It’s this little set of outcomes tucked between a giant list of things students need to be able to do in gym class and so it seems like it’s pushed to the bottom of the “important” scale. We’re required to have thirty minutes of movement activity each and every day (and that doesn’t included recesses or lunch breaks). This means health rarely happens for most teachers because it’s shoved aside for more “meaningful” lessons like reading, writing and math. 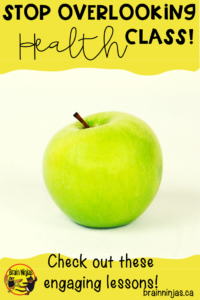 There are so many valuable lessons in health class that can actually help with reading, writing and math, so we wrote up an entire year (and then some) of lessons to try to integrate health into other lessons. You have to teach it anyway, so why not get more out of it? 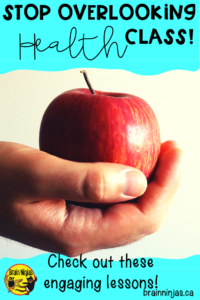 Why should you make time for health lessons every single week? First of all, teaching health is a requirement. It might seem like one of those subjects where you just observe if a student can keep their desk clean and BAM! You have an assessment done on whether or not a student organizes. But this is a pretty lazy way to teach. You wouldn’t teach math by just observing if a student counts. When we say “teach health” we mean actually putting it on the schedule for at least thirty minutes a week. You need to explicitly teach many of the health outcomes because for some of your students, they don’t have anyone at home who can teach them. Whether it’s a cultural difference regarding women discussing body health, a language barrier about foods available in your local area or social norms related to calling the police in an emergency, your students need clear, relevant information so they can look after themselves as adults. Things change from one generation to another. Mental health was not a term used in schools twenty years ago, but now students tend to have a good grasp on how it can impact their learning. Despite being taught about mental health and its impacts, some students live in fear of discussing it at home where mental health issues are considered shameful or it just isn’t talked about. Your students need to know they can discuss mental health issues in a safe and caring environment, particularly if they are ever going to be able to learn in the classroom. Building relationships can be challenging in school, but teaching all students with the same language how to interact respectfully leads to a society that can generally resolve issues, argue respectfully and work together. Not only will this impact your classroom management, your students will generally be happier if they are not always creating drama with each other. But how do you fit health lessons into your busy schedule? Most weeks we taught a specific health lesson in about 10-15 minutes a day. We would choose one of our quick lessons and do just one part so that the entire lesson was completed within a week. On short weeks (weeks with holidays or special events that interrupted our regular schedule) we would teach the longer lessons in one single block of about an hour. This made it easy to meet all of our outcomes and get lots of reading and writing hidden in our days. Our general strategy in our classroom is to teach everything on Monday and Tuesday and then work on all the worksheets, activities or projects during the rest of the week. Students work from a “to-do” list during project work time. We put the follow-up activities from our health lessons on this to-do list and they work on them in between other lessons during the week. Most weeks students get another ten to thirty minutes of health finished. Where do you start with health lessons? 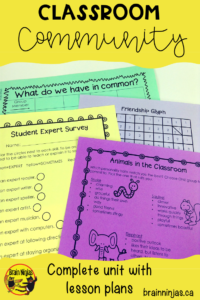 Generally we try to start the school year with some lessons that will allow students to get to know each other and the expectations of the classroom. We use some of our units scattered throughout the year and others are more of a unit that is taught from beginning to end. Our lessons are divided into units. We have several free lessons as samples to get you started if you want to see how the style of the lessons work which you can find by following the links to get to them. There are enough lessons in the whole year to teach health for SIXTY minutes a week and still not run out. 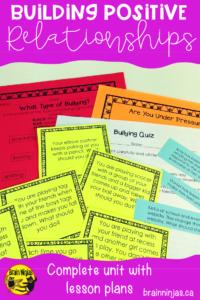 These lessons were designed to be used with students in grades four to six. 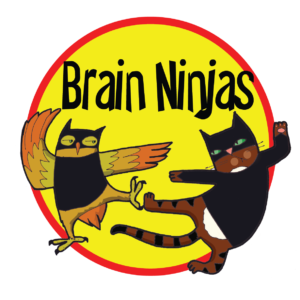 We are in the process of working on designing a set of lessons and units for younger grades. You can find that set in our Teachers Pay Teachers store. Group Activities: Communication, Teamwork & Classroom Community: Activities to help teach your students to work together as a team. The activities can be done at any point throughout the year. 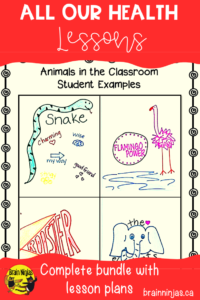 We usually start off the first week of school using some of these activities. We save the rest for times when we need to reminded that working together is a skill or when we have some time between other responsibilities and need to have a little fun. 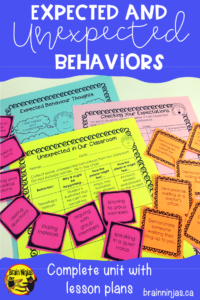 Expected and Unexpected Behaviors: This is a great one to use for starting off your school year by setting classroom expectations as well as addressing social situations for students from different cultural, intellectual or behavorial expectations. Instead of making class rules, you can talk about making classroom expectations so that your students understand right from the beginning of the year where to put things when they’re done or how to line up. We start of the year with this, but it also works as a great refresher anytime of year-especially if you get a new student or if your students are struggling with your expectations. 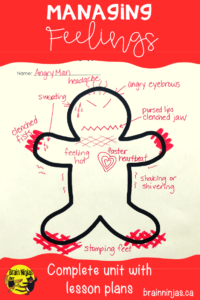 Managing Feelings: This is a unit about emotional well-being. There is a lot of talk about emotional regulation out there in the world these days, but what does it all mean? In our classroom we specifically teach students vocabulary words they can use to express their feelings. It is amazing that just having the language to identify how they are feeling can make it so much easier to calm students and get them back to learning. This unit also addresses positive self-talk and how to express their feelings in meaningful and positive ways. There is also a supplemental word wall set that comes with an editable template so you can add vocabulary specific to your students. Wellness Choices: This is a unit addressing general health such as stress, nutrition, exercise, sleep, dental care, medical care, and vaccinations. These are all lessons we assume are being taught at home, but for some students the information if new to them. We teach this unit a few months into the school year and do the entire unit all at once (meaning we teach the whole unit before moving onto lessons from other units). It includes lessons about drugs, alcohol and tobacco use which leads to many interesting questions and discussions with students. The lessons include reading passages which can be read independently or as a whole class. Building Positive Relationships: This unit focuses on creating strong friendships and preventing bullying. There are several lessons on how to report and deal with bullying, relationships with families and how to handle friends. We use this unit early in the year and then review it whenever we’re having trouble with our friendships. 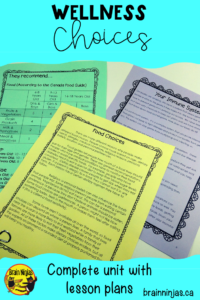 This unit is one of our best sellers because it can be taught any time of year and the lessons do not need to be taught as an entire unit, meaning you can customize what you teach based on when your students need. Life Long Learning: This unit addresses learning styles, setting goals, changes in life and prioritizing. There are activities that get students to look at how they organize and prioritize their life and school activities (this one is usually very eye-opening to parents too). Students look at how their special talents and skills can lead to jobs or careers in their future and how volunteering is an important responsibility for everyone. 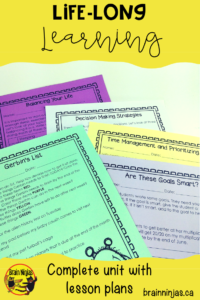 Goal-setting and how to set smart goals is once part of the unit that can be used any time of the year. We tend to teach single lessons from this unit throughout the year. 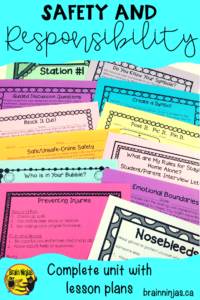 Safety and Responsibility: This unit discusses different safety precautions and basic first aid for students. Most of the first aid involves bandages and getting help from adults. This unit touches on online safety including not giving out personal information. Lessons include safety equipment and rules for recreational activities (swimming, biking), safety at home or when babysitting, and emergency situations such as fire, earthquake, tornado, and lightning storms. We usually teach this unit as an entire unit, meaning we don’t spread it out over the year. 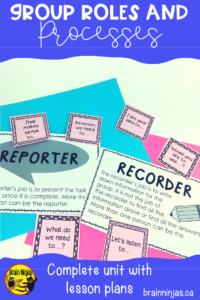 Group Roles and Processes: This is a unit to help your students learn to work together in groups. Students need to be taught how to work well in groups. Too often we assume they can magically figure it out, but anyone whose been in a group where they feel miserable can understand it’s a skill. It’s a great one to start the year with and then revisit throughout the year. Any time we are going to have students start a project where they are going to be working in groups, we pull one of these activities out so the group can decide how they are going to work together (or whether we need to mix up the groups before we get started). All of these lessons are available in a bundle (which saves you money), but don’t forget to try the free lessons to see if they work for you. You can find these on the individual lessons. Hopefully we convinced you that teaching health is important. We believe it’s because when you teach health it’s not just another subject-it has a real impact on the lives of your students. What are your thoughts on teaching health? Let us know in the comments below. We want to know how teaching health in your classroom has had an impact on your students.